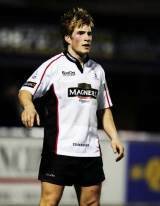 Edinburgh fly-half Phil Godman made his international debut as a replacement in a 39-9 win over Romania in June 2005 before winning further caps from the bench during Scotland's autumn internationals against Samoa and New Zealand in November the same year. Godman's first start in a Scotland shirt came against Romania in November 2006, when he chipped in with 18 points in a 48-6 victory. Earlier in 2006 he had been Scotland 'A' fly-half for the Chruchill Cup in Canada, landing an important drop-goal against the hosts in a 15-10 win. His first taste of the Six Nations came in Scotland's 21-9 win over Wales at Murrayfield in February 2007 and he retained his place for the following game against Italy. Despite his emergence in the Six Nations he missed out on selection for Scotland's 2007 World Cup squad. He would have to wait until the summer of 2008 for his next cap, running out at fly-half for the second Test win over Argentina. He retained his place as Scotland's No.10 for the autumn internationals against New Zealand, South Africa and Canada. Godman kept his place in and around the Scotland set-up but a knee injury ruled him out of contention at the start of the 2010-11 season. Godman was out for roughly a year before returning to the Edinburgh side and shining in the Pool stages of the Heineken Cup. He managed to kick the winning drop-goal against Racing Metro and was called up to the Scotland squad for the Six Nations days later.